I was at the store last night and needed some olive oil. 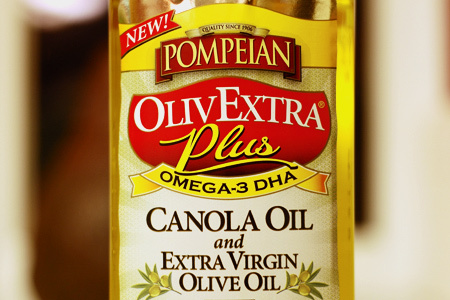 I was reaching for my usual olive oil when I spied Pompeian OlivExtra Plus. As you can see, the label is pretty distinctive and it caused me to investigate further. What I immediately noticed was that it's a canola and extra virgin olive oil blend. I thought to myself, "Dude! It's about time that someone offered that!" I love olive oil, but I usually use canola for sauteing because it has a higher smoke point. Also, there are times when you don't want the fruitiness of olive oil. This oil gives you the best of both worlds. What's more is that it's infused with 32mg per serving of Omega-3 DHA (20% of the recommended daily value), so it's even healthier than straight-up oil. I tasted it straight and it was quite nice. It has an overall neutral flavor with just a hint of olive oil fruitiness and no off-flavors. I then used it to saute some onions and I was very pleased. I cranked the heat and added it to a rocket hot cast iron griddle. I found that it does indeed stand up very well to high-heat cooking. I don't know how it will hold up for grilling, but it seems like it might work well. If you are looking for an all-around good oil that will work well in a variety of applications, I'd recommend that you give this a try. Hiya - You know I have very strong feelings and thoughts about how over used olive oil is. I read so many recipes for grilling and outdoor cooking that call for Extra Virgin Olive Oil - wow. What a waste of money and flavor! High heat grilling calls for a light, actually processed, oil like Pomace Olive oil or far less expensive canola or safflower. Peanut oil will work too. These recommended oils are all High Smoke Point oils and for high temp grilling over direct heat - what you really need. I save the expensive EVOO for drizzling on some grilled meats and veggies AFTER the cook!